Looking for a Window Air conditioner for your home or office? You are at the right place. In this article, we have covered a list of top 10 best window ac in India as of April 2019. All the latest window ACs from top brands have been listed in this article. We have covered 3 Star and 5 Star window air conditioners from brands like Hitachi, LG, Samsung, Voltas, Carrier in this article. Price of ACs on this list is between Rs. 20000 and 35000 so if you are looking for a window AC under 20000, 25000, 30000 or 35000, you will find it here. On the capacity side, you will see ACs of 1 ton, 1.2 ton, 1.5 ton, and 2-ton capacity. If you don't know what is the ideal AC capacity then here is the answer: To choose capacity you should divide your room area by 100. So, if your room is 10x10 feet, it means an area of 100 sq ft. so divide it by 100 and we get 1 so go for 1 ton AC. If your room is 12x12 that means 144 sq ft so go for 1.5 ton AC. For large rooms of around 200 sq. feet area, go for an Air conditioner with a capacity of 2 ton. If you need an inverter ac, you have to go for a split ac. Check out the best 1.5-ton inverter ACs available in India. 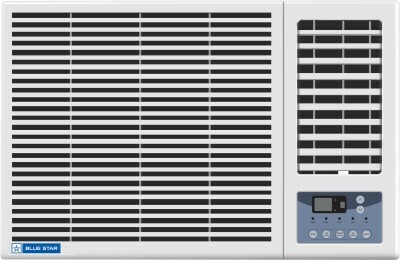 Let's take a look at the list of best window ac in India. We have provided a brief review of every air conditioner with specs and pros cons. This window AC from Voltas comes with a capacity of 1.5 ton suitable for a room of around 110 to 150 sq. feet (small to medium-sized rooms). It has a cooling capacity of 4800 W and consumer around 1650 Watts electricity. It is 3 stars rated so you are getting decent power savings. There's an LED Display on the front of the Air Conditioner to display the temperature. The AC comes fitted with an anti-bacterial and Silver Nano filter which helps to deliver fresh air to your bedroom or living room. Other features are usual like the timer on and off, auto restart etc. There is self-diagnosis functionality as well so if there is anything wrong with the AC's inner functionality, it will prompt you so that you can call the technician immediately. The AC has 100% Copper condenser which is durable and provides better cooling. It can also bear the heat and high temperature like 50 degrees and perform decent cooling. Voltas is one of the best and most popular AC brands in India. Their products have good quality at decent prices and similar is the case here. This Window AC has good build quality with solid design and offers decent cooling. Voltas has a great after sales service network in India so if something goes wrong with your air conditioner or you need to get it serviced, you won't face any issues. Overall a very good option at a price of under Rs. 25000. Lloyd, in the last 2-3 years has made a strong mark in the electronic appliances industry. This Lloyd Window AC is a 1.5 Ton, 3 Star Rating AC with a Cooling Capacity of 4900W. It has a copper coil which makes it long lasting with better efficiency and better cooling speed than the Aluminium Coil. It is of 1.5 Ton and hence would suit a 110 - 150 sq ft of an area or a room of size 10 X 15. In terms of energy efficiency, it is a 3 Star Rated Air Conditioner and saves around 15 percent compared to 1 star rated AC and around 8 percent when compared to 2 Star Rated AC. The 3-Star rated AC consumes around 15 percent more electricity compared to a 5 Star AC. This Lloyd Window AC comes with Auto-Restart feature, where it resets to the last setting after the power cut and also has the Sleep mode that adjusts the temperature by itself to comfort while sleeping, Timer On/Off etc. It also has Anti-Bacteria and Dust Filter and self-diagnosis feature to alert you if there is an internal problem that requires maintenance. In our reviews, the AC offers decent cooling in the price range of 25k but not the best when compared to other AC priced 10 to 15 percent higher like Hitachi. The company provides a warranty of 1 Year on product & 5 Years on the compressor. Carrier is one of the top air conditioner brands in India. This 1.5-Ton Window AC from Carrier offers powerful cooling. The cooling capacity is 5250 W which is higher than other 1.5 ton AC. It will work great in a room with an area of around 140-150 sq feet. The power consumption is 1800 W which is on the higher side. It has a display on the front to display temperature. There is no display on the remote though. Usual features like auto restart, sleep mode, smart diagnosis, timer, and auto swing. One useful feature is smart time guard which is an Intelligent timer in this carrier window AC. It protects the compressor by ensuring that there is a minimum compressor off time of three minutes. This allows for instant availability of compressor cooling after a power failure in excess of 3 minutes. If the power failure is of duration less than 3 minute, the STG keeps the compressor off and ensure 3-minute delay. This AC comes with a 1-year warranty on complete unit and 5 years on compressor. Carrier has a decent after sales service network so you won't face any issues while claiming warranty or getting your air conditioner serviced after a year. 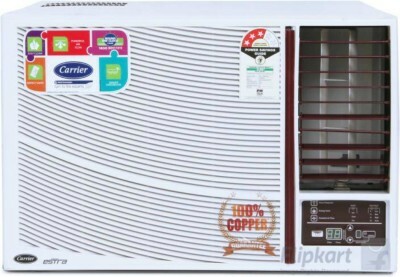 If you are looking for a 1.5 Ton Window AC under 25000 and 30000, then this is a good option from Carrier. Hitachi is one of the most powerful brands in the Air Conditioner market. This Window Air Conditioner has a capacity of 1.5-ton, so it can easily cool a medium sized room with of approximate area of 100-150 sq ft. It is a power efficient AC with a 5-star 2018 BEE Rating and will consume around 15% less electricity than a 3-Star Air Conditioner. This Hitachi Window Air conditioner has a copper coil which is long lasting and has low maintenance cost compared to the AC fitted with Aluminium coil. The cooling capacity of this AC is rated at 5275 W and uses an Auto Climate Technology through which it regulated the inner room temperature as per the outside environment resulting is efficient electricity usage. To ensure hygiene and clean air, this AC comes fitted with a Koukin Filter through which it prevents the growth of bacteria inside the Air Conditioner and also has an indicator to notify when the filter should be cleaned. It also features various modes like Dry Mode(Fan runs at slow speed and the compressor is switched on only at certain interval), Powerful Mode(Cools very quickly), Auto Saver Mode(Saves Energy) which the user can change between depending on the requirements. Hitachi offers a great after sales service and the prices are on a little higher side because of the quality it offers. It is one of the best 1.5 ton Window AC under 30000 in India. Hitachi is the leader in the Air Conditioner market because of the quality and service it offers. This Hitachi Window AC is one of the best 1 Ton Air conditioners and can quickly cool a small room with an approximate area of 90 sq ft. - 100 sp ft. It is a 3 Star Rated AC which means it would consume around 7-8 Percent less electricity than the 2 Star Rated Variants and around 10 percent higher than of 5 Star BEE Rated AC. So if your usage is less, like 2-3 hours in a day, we would recommend choosing the 3 Star AC. But if you are looking to use the AC for 8-10 hours a day or more, you must choose the 5 Star Rated Air Conditioner. Hitachi Window AC is a super silent AC and comes with some user-friendly features like auto restart with previous settings in case light goes off and on, there is a timer mode to turn on or off the AC, dust filter for improved efficiency by removing bacteria, microbes that grow inside the AC. This is a Copper Coil AC which has a better life cycle and provides better cooling compared to Aluminium Coiled air conditioners. This AC has a cooling capacity of 3750 W and can perform good cooling for temperature as high as 52 Degree. It has an additional moisture removal mechanism which is very useful for areas that experience higher humidity than normal. This is one of the best window air conditioners under 25000. Lloyd has been aggressively promoting the brand in the Air Conditioner domain from last 3 to 4 years and offers a decent product at a pocket-friendly price. This Lloyd window Air Conditioner has a capacity of 1-ton and is suitable for small office or house rooms having an area less than 90 sq ft. It has a 3-Star BEE rating, so if you use your AC for around 2-3 hours in a day, this AC would be economical in terms of electricity consumption but if you use AC for around 8-10 hours a day, we would highly recommend you to buy the 5-Star AC. This AC has a cooling capacity of 3421 W and comes with all the basic features like auto restart, dehumidification, anti-bacteria filter and a dust filter making it a great value for money product. In terms of cooling and build quality, Lloyd AC scores decently well if not the best and you would not have any complaints. Along with a warranty of 1 Year on Product & 5 Years on Compressor, this Lloyd 1 Ton window AC comes with Two Free Services within Warranty Period. This AC is one of the top picks for best AC in Rs 20000 to 22000 budget. This Blue Star Window AC has a strong cooling capability and can cool a small to medium sized room very quickly. This window AC has a capacity of 1.1 Ton and is suitable for an office or living rooms of sie 90-120 sq ft. It comes with a copper coil which requires less maintenance and is long lasting and has an energy efficiency rating of 5-Star making it very power efficient. This Hitachi window AC comes with several features like Auto Climate Technology through which it adjusts the temperature and fan speed based on humidity and outside temperature. It also has a powerful mode through which it can quickly cool a room and an auto fan speed feature, auto restart mode, timer on/off etc. It also comes with an Anti-bacterial filter that enhances the durability of the AC and also provides hygienic air to breathe in by filtering and preventing the growth of bacteria and germs. It comes with 1 Year on the complete unit and 5 Years on the compressor. If you are looking for a powerful 1.1-ton Window AC under 25000, this Blue Star window AC is the one you should consider buying. Carrier 24K Estrella Plus Window AC is a very powerful 2-ton Air Conditioner and can easily cool an office or living room has an area of approximately 200 sq ft. This Window AC has a cooling capacity of 5900 W with a 3-Star BEE Rating making it power efficient choice. These 2-Ton capacities AC have high electricity consumption, if your usage is more than 3-4 hours a day, we would recommend buying a 3 or a 5 Star Rated AC like this one. Carrier Window AC comes with all the basic features like Sleep Mode, Turbo Mode, Auto Restart, Timer on/off and so on. It has a dust filter and active carbon filter but it does not come with features like dehumidification(adjusting the temperature by itself based on humidity) or auto cleaning of the filters. This Window AC comes with a standard warranty of 1 Year On Product & 5 Years On Compressor. There are limited options in the 2-ton air conditioners but if you have a big house or shop and need high capacity AC, then you can buy this for a price of under 35k. Hitachi is a Pioneer in the Air Conditioner Industry for the quality product it offers. This Hitachi Kaze Window AC is a very powerful 2-ton AC with a cooling capacity of 6160 W and can quickly and easily cool a room measuring 10 X 20 Sq ft. It is a 2-Star BEE rated AC, so it will consume little extra electricity than a 3-Star Rated AC but since they are powerful, you won't find a need to keep them switched on for long. This window AC, as other Hitachi AC, comes with the latest technology and unique features like Auto Climate Technology (ACT) in which it adjusts the temperature of the room based on outer humidity and temperature. It also has several modes like Sleep mode, Dry Mode, Auto Restart, Super Silent mode etc and has a dust filter to trap any unwanted dust particle or bacteria. It comes with an auto clean feature through which it does not allow growth of bacteria or any virus inside AC and also has a filter change indicator to always provide a clean and hygienic atmosphere. Hitachi offers a great service after sales and has a wide network of service centers so you can choose this company irrespective of you living in any part of the country. This AC comes with a warranty of 1 Year on Product & 4 Years on Compressor. So if you are looking for a 2-ton AC. This Hitachi Kaze Window AC should be your top pick. So this was the list of best window ac in India 2019. We hope it was helpful and you were able to find a suitable air conditioner according to your usage and budget. If you need to see more options in 1.5-ton window airconditioners then take a look at our article on best 1.5-ton window ac in India and if you are looking for options in the split category, see the list of best-split air conditioners.